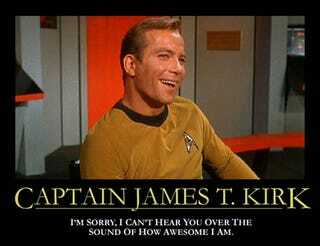 Do you know why James T. Kirk is happy? Because those crazy Europeans are developing a magnetic shield that will protect spaceships when entering the Earth's atmosphere. Well, that and because he's thinking about doing naughty things with Uhura. The new magnetic heat shield—developed by EADS Astrium, the German aerospace center, and the European Space Agency—is expected to complement or replace traditional ceramic heat shields entirely. The field will be generated by a super-conducting coil, deflecting atmosphere particles from the surface of the spaceship and, therefore, eliminating friction.